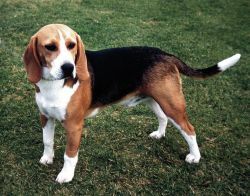 a medium-sized, shorthaired hound, bred originally for hunting but much used now as a genetically stable experimental animal. Some congenital and inherited disorders seen in the breed are epilepsy, factor VII deficiency, hemophilia A, lymphocytic thyroiditis, and a number of ophthalmic abnormalities. severe meningitis and polyarthritis of unknown etiology with fever and severe cervical pain; seen in mature Beagles. from an early age, affected dogs develop stiffness in their legs, eventually walking on their central toes. The skull is broad and the eyes are slanted. Some studies have indicated similarities to the human disorder, pseudohypoparathyrodism. It is believed to be an inherited disorder. Aberystwyth University's Dr Dave Barnes headed a team which constructed a robotic arm on Beagle 2. I sent a letter to Nasa saying would you be interested in taking the Beagle 2 lander as a stand-alone package on a rover. That isn't to say we have in any shape or form given up on Beagle 2. Researchers from De Montfort University and the University of Leicester have worked together to come up with a new way to detect the configuration of the lander--reflection analysis--matching simulated and real images of Beagle 2. Matter's team is incredibly grateful to Charlie and The Beagle Staff. Scammer: "Since I don't hear from you and the beagle food is too expensive and I don't think I can bear it anymore maybe I will kill him or I should drop him inside a river close to my house here cus am travel today. He would love that this could inspire that next generation to do Beagle 3. His daughter Shusanah said her father would have been pleased at the success and able to "defy the critics who want to say that Beagle 2 is a failure". I view it as a great achievement that the team built Beagle 2 in a little over four years and successfully landed it on the surface of Mars. This finding shows that the Entry, Descent and Landing, or EDL, sequence for Beagle 2 worked and the lander did successfully touchdown on Mars on Christmas Day 2003.